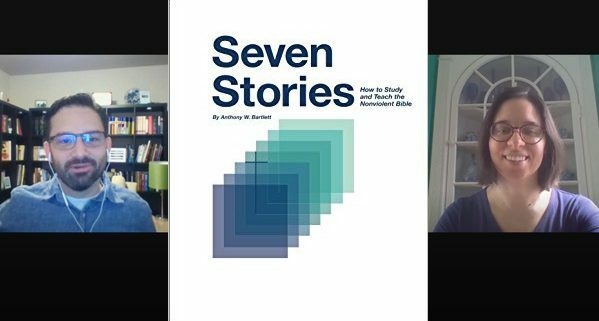 In this episode of the RavenCast, Lindsey Paris-Lopez and I discuss Anthony Bartlett’s latest book Seven Stories: How to Study and Teach the Nonviolent Bible. You can watch the video of the conversation below, or listen to the podcast above. You can also subscribe to the RavenCast on iTunes or Stitcher Radio. Is the Bible essentially a violent book that calls people to acts of violence? Or is the Bible a book that moves us from violence to nonviolence, justice, and love? Those are some of the questions Tony Bartlett explores in his latest book, Seven Stories: How to Study and Teach the Nonviolent Bible. The book is perfect for personal study and for group study. It is organized into Seven “stories,” or chapters, along with a beginning section that lays the foundation for Tony’s interpretive methods, with a heavy emphasis on mimetic theory. If you want to learn about the Bible, in my opinion there is no better book than Seven Stories. The “Stories” do not ignore the violence within the Bible. Rather, Tony shows how the violence in the Bible is purely human. Tony claims that the Bible also is a product of “semeiotic shifts” in the human understanding of God. This refers to radical transformations in our understanding of God. The Bible subverts its own violence, and Tony reveals how God is behind the biblical subversion of violence. And yet, the Bible also shows that God stands with the oppressed. The God of the Exodus hears the cry of the oppressed and works for justice. The prophets also proclaim a God of justice. And Jesus claims that God has a special blessing for the poor and those on the margins. We invite you to join us during the next six weeks as we discuss this invaluable book! Keep up to date on future episodes by liking the Raven Foundation Facebook Page!